The UIC Department of Computer Science will be receiving a fifth year of funding as part of an initiative to improve the diversity of talent in undergraduate computer science programs. The BRAID program, which stands for Building, Recruiting, And Inclusion for Diversity, involves 15 universities working to address specific issues. These include modifying computer science courses to make them less intimidating and more appealing to underrepresented students; leading outreach efforts for high school students and teachers to build a diverse pipeline of students; build confidence and community among underrepresented students; and promoting joint majors in areas like computer science and biology. Robert H. Sloan, professor and head of the UIC Department of Computer Science, secured BRAID funding for the university when the program was first announced in 2014. UIC’s computer science department has increased the number of women and underrepresented minority students enrolled in its undergraduate computing courses, and BRAID funding augments these efforts. In the past five years, the percentage of females enrolled in UIC’s computer science program has increased from just over 12% to almost 18%, with 217 women enrolled as of the fall 2018 semester. During the same time period, underrepresented minority enrollment increased from 117 students to 246 students, but remained at just under 20% of enrollment. Elena Lathos, a program coordinator with the UIC Department of Computer Science, said the BRAID funding will assist student organizations and send approximately 40 undergraduate students to the Grace Hopper Celebration in the fall. The Grace Hopper Celebration is the world’s largest gathering of women technologists, with more than 20,000 women from 78 countries attending in 2018. About one-quarter of the participants are students; professionals at all levels and recruiters make up the majority of the attendees. The three-day event features professional development workshops, technical tracks, and an opportunity to network. Lathos said in addition to the bond the students form who attend Grace Hopper Celebration together, before they depart, professors and previous attendees meet with them to offer advice on what to pack and how to prepare for the interviews and events of the trip. A reunion of all current and former students and faculty who have attended Grace Hopper is in the planning stages. “Almost all of the students come back with an internship or offer of employment. 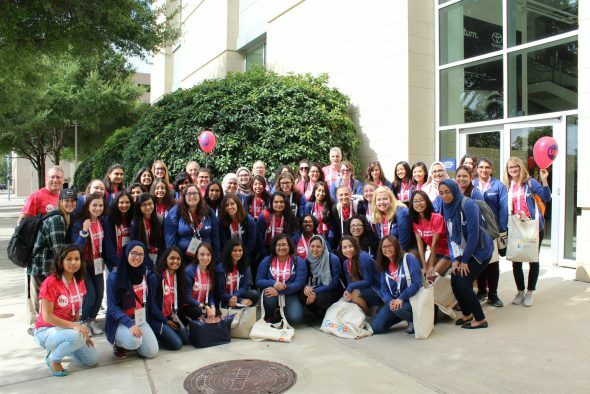 There is an overwhelming amount of companies at Grace Hopper that our students wouldn’t normally have the opportunity to connect with,” Lathos said. BRAID funding will also support sending several UIC students to the Tapia Conference this fall, a conference that celebrates the diversity in computing. Last year 1,400 attendees from more than 250 schools participated in Tapia, which connects students with others with common backgrounds, including ethnicities, disabilities and gender to create communities that extend beyond the conference. UIC’s Computer Science Department expects to receive the $30,000 of BRAID funding later this spring. Intel, Qualcomm, and Microsoft are among the current and anticipated funders this year.